MasterCard Worldwide has announced the availability of the MasterCard MoneySend service for BlackBerry Smartphones, a convenient way to transfer money in the United States from person-to-person easily and securely by combining the power of a mobile device with a banking relationship. MasterCard MoneySend is available for free download on BlackBerry App World. 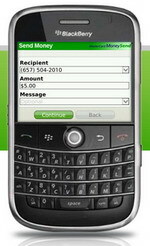 0 comments on "MasterCard MoneySend for BlackBerry launched"